If you mention the name Hinckley around your local marina, most boaters may respond (add your local accent here), "Aren&apos;t they that sailboat company that started building those diesel-powered jet-drive picnic boats a few years ago?" Yes, Hinckley is that, and quite a bit more. 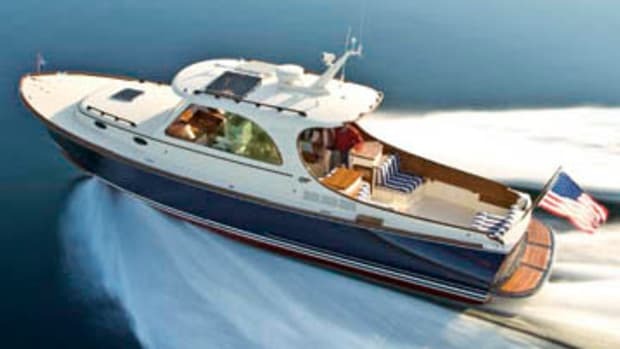 For instance, it is one of a few production boatbuilders that sells factory-direct, exclusively. 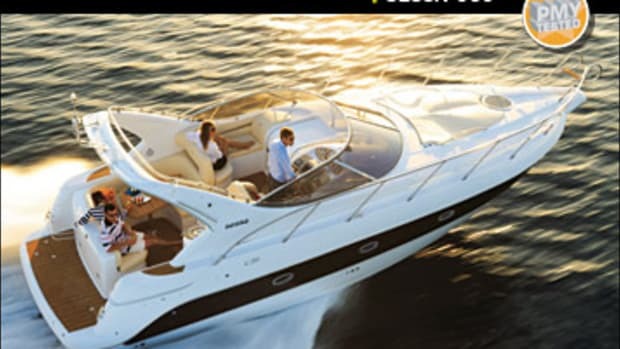 In addition, it services all its boats personally, via a network of full-service yards located in Southwest Harbor, Maine; Portsmouth, Rhode Island; and Stuart, Florida. Eric Champlin, Hinckley&apos;s sales director, told me the builder recently launched an owner-assistance program called Hinckley 24/7 Service, which members can access by calling an 800 number. 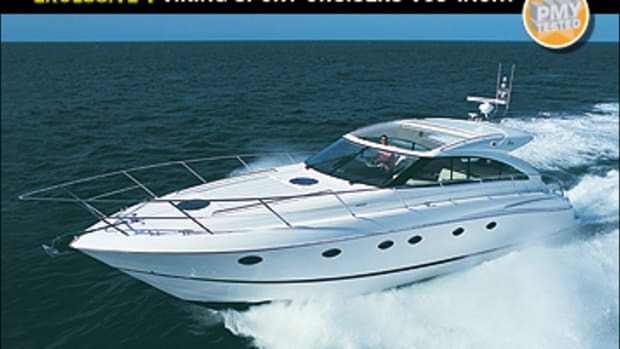 It allows customers to contact Hinckley technicians anytime for information about any aspect of its boats. 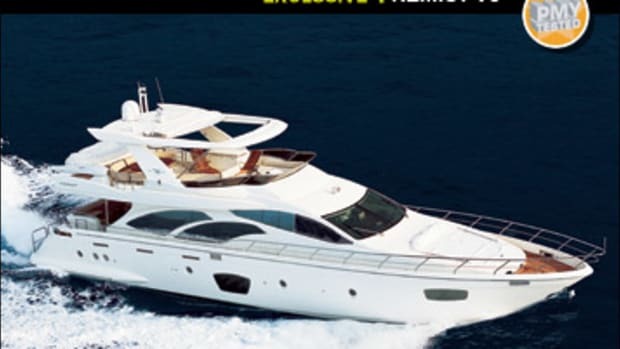 The company, however, doesn&apos;t think you&apos;ll need that number too often, a feeling reflected in a new warranty program that offers a variety of coverage, including a ten-year limited and transferable hull-and-deck warranty and a nontransferable limited lifetime warranty on the hull and deck. These are impressive programs from an impressive builder. I say this based partly on my test of Hinckley&apos;s latest flagship, the T44 FB, a flying-bridge iteration of the 44 Talaria. The moment I boarded her I could see the T44 was as thoroughly finished as those service programs are comprehensive. My test boat, which was Hull No. 3 of the flying-bridge version, looked flawless as I gazed down her dark-green Awlgripped hull side. (Colored Awlgrip hulls are standard for the 44.) Her mirror-finish hull is also sturdy, compliments of Hinckley&apos;s DualGuard Composite construction. The 44&apos;s outer skin is comprised of Kevlar and E-glass, with aircraft-grade balsa-core sandwiched to the keel to stiffen the structure and reduce weight. The inner layer is made of carbon fiber, yet another lightweight and strength-enhancing material. 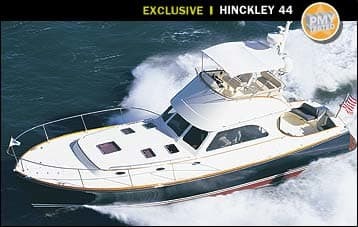 Hinckley bonds everything together using the patented SCRIMP system, in which the hull is laid up dry and vacuum-sealed and a precise measurement of vinylester resin is injected into the void. Aside from being environmentally friendly, SCRIMP provides maximum saturation of resin and makes the hull one piece. Here the result is a durable structure and a boat that&apos;s also relatively light: 25,000 pounds, dry. As classy as the 44&apos;s hull looks outside and as tough as she is inside, her interior fit and finish is equally impressive. The 44 features an abundance of warm, satin cherrywood. It creates an attractive and uniform appearance, and the satin finish nicely accents the standard high-gloss teak-and-tulipwood sole. The sole&apos;s finish is as hard and durable as it is shiny, thanks to a two-part process, but the coolest part is its seamless appearance: There are no latches on the hatches. To access the bilge and stowage areas below, you simply use a suction cleat to lift and remove the panels. Say goodbye to stubbed toes. However, I was disappointed that Hinckley still uses bulky hook-latches below decks to secure the solid-cherry panel doors for the master stateroom. This look is in stark contrast to the uncluttered appearance of the sole, and I wonder if there isn&apos;t an equally covert way to secure the doors, which I found to be a bit narrow--about 17 inches. Even with my 5&apos;7", 160-pound frame, I had to turn sideways to get through both doors. Space was also an issue for me in the 44&apos;s engine compartment. 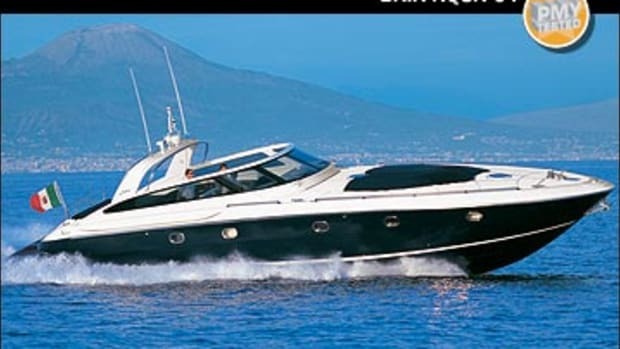 The twin 440-hp Yanmar diesels (the only engine option on the 44) are accessed via the saloon sole and somewhat shoehorned under it, especially the starboard motor. To do major work on this powerplant would require lifting the sole, removing the flying-bridge ladder, and then lifting or removing the engine box. There is, however, plenty of room for four to have a cozy breakfast or lunch at the U-shape dinette aft and to starboard of the master. Also convertible to a cabin for the kids, it is conveniently located across from the galley, which comes standard with a two-burner Kenyon cooktop, a Sharp convection oven, a Hinckley water-cooled top-loading freezer, and front- and top-loading refrigerator. There&apos;s no doubt that Hinckley did its homework for the 44&apos;s looks and layout, so I wondered if the same held true for her performance. I&apos;d heard so much about the builder&apos;s JetStick, a joystick-like control that simplifies maneuvering the boat via three modes: Docking, Power Steer, and Helm. In docking mode you turn the JetStick left or right to pivot the boat, while pushing it forward or back provides propulsion. All this movement here is done with waterjets, not propellers. 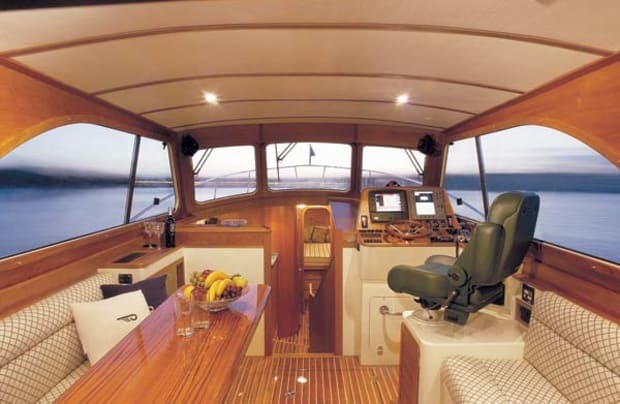 Move the stick left and right, and the standard 24-volt ten-inch bow thruster swings the bow. Power Steer and Helm mode let you use the JetStick or wheel with hydraulic steering, respectively, to maneuver while the 44&apos;s underway. 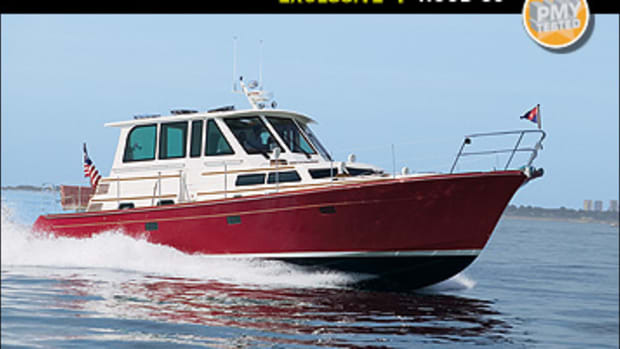 In either case, the Yanmars&apos; engine rpm is adjusted smoothly compliments of standard Mathers MicroCommander single-lever electronic controls. Champlin started up the diesels, and using Docking mode, he deftly maneuvered the 44 out of a slip, even with boats located to the left and right and a third boat almost dead ahead, about one boat length. As we cleared the manatee zones, Champlin ramped up the diesels to 3200 rpm. 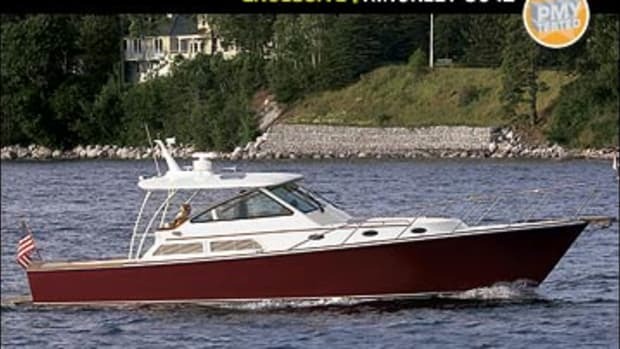 Over several speed runs, my radar gun displayed an average top speed of 37 mph, which combined with her standard 500-gallon fuel capacity lets the 44 achieve a range of 378 NM. Take her down to 2750, and she makes a comfortable 29.3 mph with a range of 597 NM. Champlin handed me the JetStick at the flying-bridge helm, and I soon discovered this boat is as easy to handle as they come. With some basic guidance in its functions from Champlin, I was running the 44 from the get-go, and not even the strong current and 15-mph-plus wind could keep me from placing the 44 in whatever position I wished and holding her there. One safety feature that impressed me was the stick&apos;s ability to center itself. For example, say you&apos;re going into a turn and start to feel uncomfortable with the radius or speed. Just release the stick, and it returns to center. In addition to the strong feeling of being in control, I discovered that at the flying bridge, trim tabs were not necessary and sightlines were excellent. At the lower station, which also has the JetStick, some tab was needed as I had a problem seeing ahead. This was not reflected in her trim angle, however, which was only 4 degrees at its highest point. In addition to her looks, speed, and ease of handling, the 44 is remarkably quiet: My decibel meter read only 76 dB-A at WOT at the flying-bridge helm (65 dB-A is the level of normal conversation). 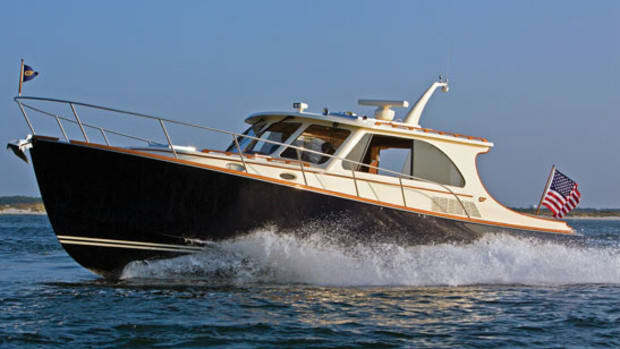 Champlin attributes this sound attenuation to a combination of lead-lined foam in the engine boxes, double gaskets on the engine-box cover, baffled and insulated air intakes, custom mufflers, an insulated wet exhaust system, and sound-absorbent material placed under the sole and overhead in the pilothouse. After spending the better part of the day at both helm stations, I concluded this is one of the most well-rounded boats I&apos;ve tested. 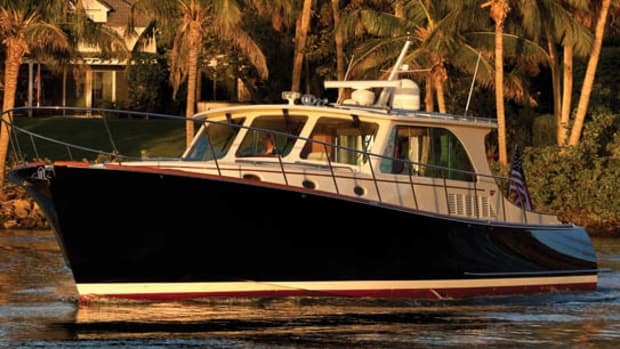 With the highest-grade materials, a meticulously finished interior, easy-to-operate helm stations, a long list of standard amenities, and a striking New England profile, the 44 is also backed by an unusually comprehensive service and warranty program. Hinckley has clearly stepped up its game.